Activision CEO Bobby Kotick says every new console generation has resulted in higher development costs and this one will be no exception. We may not know exactly what the next generation of game consoles has in store but we do know that it's coming soon, and however it works out the big dog at Activision says the cost to make games for it is almost certainly going to go up. "This is my twenty-second year doing this, and every single console transition we've seen an increase in development costs," Kotick said in a post-earnings call to investors. "Over long periods of time it gets smoothed out, but I would say this is not a transition where that's going to be an exception." "We're going to have to figure out how to take advantage of the unique abilities of new hardware and that requires new skills and investment in tools and technology and engines and so yes, that's likely," he added. 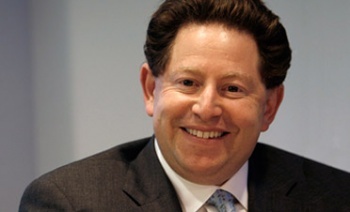 Kotick's comments have a bit of an ominous ring to them, in that they could be an early hint of higher game prices in the next console generation. Activision recently reported revenues of over $4.8 billion in 2012 so it's not as though it can't afford to eat some rising expenditures, but it didn't get to where it is today by being a charity. On the other hand, Take-Two Interactive CEO Strauss Zelnick expects development costs will stay more or less flat into the next generation. "We don't have any reason to believe our dvelopment budgets will change significantly," he said. "If anything we have become - group-wide - much tighter in terms of how we spend our money. We can't say specifically, but no, we don't expect to see a meaningful change in what it costs us to release these top quality products."